The multi-talented Tyrese Gibson is known only by his forename, so successful is he in the many different fields in which he works. From rapping to acting, modelling to producing via TV work, screenwriting and writing, the American always excels and is recognised for roles in high-profile films such as Four Brothers as well as Fast and the Furious and the Transformers series: two of history’s highest-grossing film franchises that have propelled him to Hollywood superstardom. 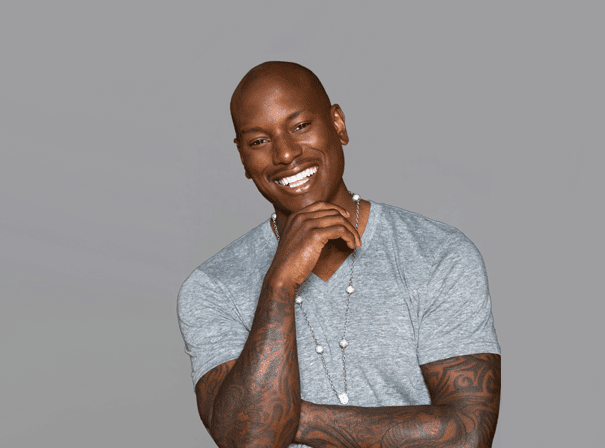 Active since the nineties, Tyrese was initially an innovative hip-hop and R&B musician with major-label success. At this stage he had already made a number of appearances in a notable ad campaigns for globally recognised brands Coca-Cola, Guess and Tommy Hilfiger. His debut singles ‘Sweet Lady’ and ‘Nobody Else’ rose quickly on the Billboard Top 100 Charts, turning heads across the music industry and preceding the commercially successful albums Black Rose and Open Invitation. Gibson has authored several graphic novels and penned two New York Times best-selling books, the eye-opening titles How to Get Out of Your Own Way and Manology: Secrets of Your Man’s Mind Revealed. Tyrese continues to appear on the big screen, wowing audiences with an engaging and high-octane acting style that has made him one of America’s most adored personalities.